256 Mo RAM. 5 Mo Disk Space. JRE 1.6 installed. 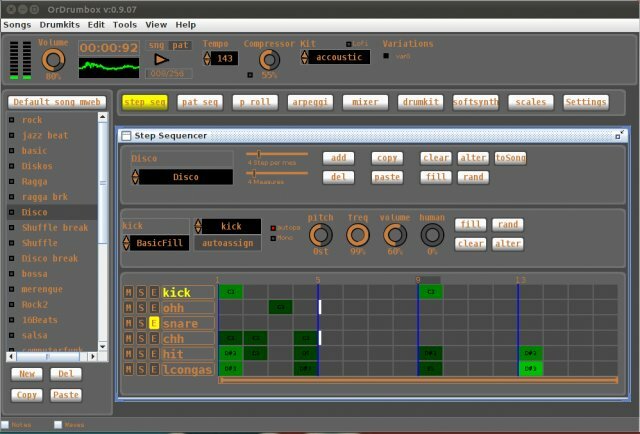 orDrumbox is a pattern oriented audio sequencer. You 've got patterns of 16 (or 32 or what you want) beats . You can choose a time signature and a number of measures for each pattern. Each pattern is composed of tracks. Each track contains one sound. The sounds can be pitched and mixed and panoramized, muted/solo and filtered with the interface. You can add loop points at the step you want independently on each track. You still can add notes after the loop point. Each track is composed of notes (one note by beat). On each note, you can independently control pitch (from -24 to +24 semitones) and volume (4 levels of velocity). An arpeggiator with presets is assigned on each track. You can add melodic scales and semi-random notes to let the orDrumbox compose rhythmic and melodic patterns under your control. It's designed for creativity. Just define some rules and the orDrumbox will play generating beats variations and melodic lines. A scale editor is also available. You can import, create, modify and save Drumkits. A Drumkit is a sound library, (an assorted set of instruments). You can import your own sound files and use them as instruments with the orDrumbox. Some controls are available for each sample: volume, pitch, filter, threshold. A soft synth (real time sound generation) is available with 2 vco, 1 LFO, ADSR controls and filters (cutoff, resonance). orDrumbox uses standard (windows) WAV files for drum samples, so you can easily add your own or download wave from the net. The orDrumbox use Natural Language Processing for matching sounds to tracks and for typing sounds (amazing). Just name a track with a "standard like" name of instrument (i.e: "electric bass 1" or just "bd" ) and the orDrumbox will assign it to the nearest instrument available in the current drum kit depending of the current music style. Audio mixer with volume, pitch, panoramic, solo/mute and filters. Posted by budhi on Thu, 05/17/2007 - 22:14. Posted by Robert Marley on Wed, 05/25/2005 - 12:23.